We all are familiar with making plans and preparations. We plan a vacation; make hotel reservations, airplane reservations or gas up the vehicle, plan sites to visit along the driving route and sites to visit at destination, restaurants in which to eat, and social events to attend. Our expectations are elevated and our spirits are excited! We are preparing for “level” of relaxation and anticipation of a wonderful time. Yet… we seem to fail in the area of preparation for our soul, few if any plans to move to another level of understanding of the word of God, another encounter with the Lord, another level of praise and worship, another level of expectation. When we fail to prepare, we actually prepare to fail! Failure is not an option with our eternal souls. We have been created from the beginning with eternal life. The question is where we will reside for eternity. We have the ability to make choices. The scripture, Joshua 24:15 states “choose you this day whom ye will serve”. We have to make a decision…will we serve the True and Living God; the God that loved us and gave his only begotten son for eternal lives??? Or will we chose our way… the ways of the world? Scripture tells us the wages of sin (the ways of the world) is death! Therefore preparing for the next level of life is essential. If we want to move to the next level we must catch the vision, the plan of God for his people; make reservations through repentance and acceptance of Jesus Christ as our Lord and Savior; receiving the Holy Ghost; plan for the creation of a clean heart and renewing of a “right spirit”; plan to walk in the blessings and favor of the Lord; plan to hide the word of the Lord deep within our hearts so we will not sin against him; plan in all our ways to get understand and wisdom; feast at the table of the Lord; relax in his goodness and mercy and spend eternity in his presence. 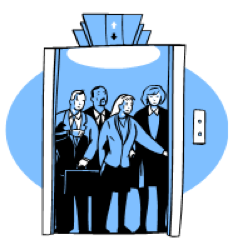 The elevator door is open… are you ready to go to the next level??? GOING UP!!!!! Psalm 126:3 declares , “The LORD has done great things for us, and we are filled with joy.” Your love for God and for people is the fuel to deliver the message of hope and to build the Kingdom of God. © 2019 First Church Of God. All Rights Reserved.